15.6 inch Toshiba Satellite C55-A5300 is a reliable, fast and nice looking computer designed for your everyday computing needs- word processing, internet browsing, preparing assignments, music and videos as well as playing some games. It is great for school, home and work and at a price that can't be beaten (under $300) at Amazon.com. Intel Celeron 1037U 2MB Cache processor at 1.8Ghz speed, 4GB DDR3 SDRAM memory for multitasking- expandable to 16GB, 500GB Hard Drive.. As long as you're not going to play the latest 3D games or run advanced engineering softwares on it, performance level of this computer will be more than satisfying for your day-to-day needs, with its impressive (lowest) Microsoft quality index score of 4.8. It is much faster and more powerful than what you'd expect at its price range. The system boots up from zero in about 12-13 seconds and you can transfer files from external drives quickly. It has a bright and clear 15.6" LED-backlit TFT high-definition widescreen display at 1366x768 pixel resolution with TruBrite technology and Intel HD graphics with shared video memory and good sound quality through the built-in speakers- but you need to install the Realtek audio drivers for free from the Realtek site when you first buy it, otherwise the sound will not be that great. 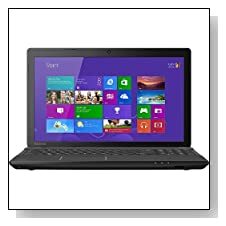 Trax horizon finish in satin black Toshiba Satellite is easily portable at 5.4 lbs weight and 1.40 inch thickness and comes with a standard comfortable keyboard with 10-key numeric keypad for easy data entry. Operating system is the 64 bit version of Windows 8, which is not the favorite of many although it provides a stable platform. And if you'd like it to appear as Windows 7, you can always switch to the classic view and download a start button. In terms of connectivity, you get 802.11b/g/n wireless, HD webcam with microphone, Multiformat DVD±RW/CD-RW drive with double-layer support, an HDMI port for flexible connectivity, a Multiformat media reader that supports 6 formats, 3 x USB 2.0 ports, 10/100 Ethernet LAN and RJ-45 connector for easy wired connection. Verdict: You get more than what you pay for with Toshiba Satellite C55-A5300 and it is as good as a laptop gets at less than $300. 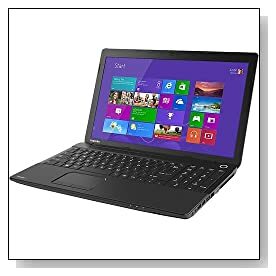 Sufficient memory and hard drive, fast processor, nice looking screen, good audio quality, comfy keyboard and a good selection of connectivity ports. It will do its job for everyday computing, whether it is songs, movies, web browsing, spreadsheets, presentations and even gaming. Unless you want to spend much more for a computer with higher specs, you can't go wrong with this Toshiba.